This post should really be titled “The Hubby who wants to be Hugh Fearnley-Whittingstall”, oh and I before I go on I suggest veggies, click away now! Hubby’s first flit with being Hugh started last summer when he built a clay oven in the back garden. Give him his due it turned out to be a fab oven and that blog post still remains one of my top google hits. With summer just about here Hubby has put his Hugh hat back on. This time it’s the turn of nettle Beer, bacon, salami & chorizo. It has reached the point to where he has built his own smoker and the outhouse has become the place of preserved meat all hanging from the beams. All of this has come about since I purchased Meat. I am thinking of also buying Fish, but am a bit hesitant as to the fact I may come home one day and find Hubby filleting a huge fish ready to smoke in his homemade smoker! 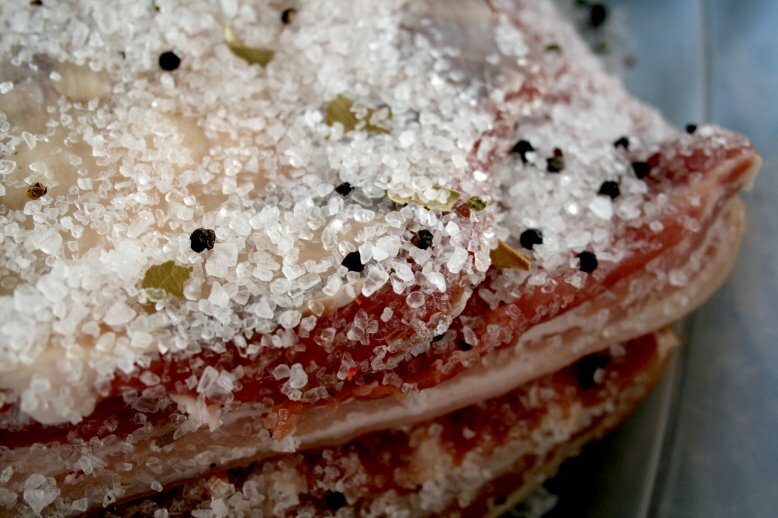 A couple of weeks ago hubby started on the cured belly pork, which in theory will turn into streaky bacon. He dry cured it with salt, peppercorns and bay leaves, wrapped it in muslin then hung it in the outhouse to dry for a week. The first time we tried it, it was unbearably salty because Hubby hadn’t washed the salt cure off properly so after a good soaking in water and another week of hanging it’s now tasting a great deal more edible. In the next few weeks he is planning to smoke half of it. Some people use saltpetre to maintain the colour of the meat however were unable to get our hands on saltpetre (unbeknown to us at the time apparently used in bomb making) not surprisingly the woman in Holland & Barret gave us a rather scared look when we asked for it! 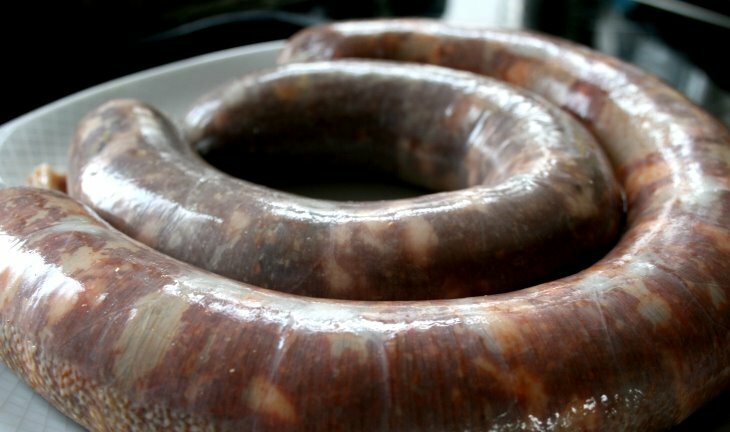 This weekend Hubby’s new sausage making kit arrived so he decided to try and make chorizo and salami. The basic method for the two are very similar apart from chorizo has paprika and the salami he made had different spices and pistachios in it. I have to admit I left him too it. The sight of the ox runners (intestines) were reminding me too much of specimens I studied during the Parasitology module in Uni! Given the fact I was slightly freaked out by the ox runners the meat mixes he made up smelt very authentic. These sausages are also now hanging up in the outhouse. I look forward to trying them in about 4 weeks time. The Cottage Smallholder are also curing pork and salami at the moment and it has been great reading their blog and getting tips.